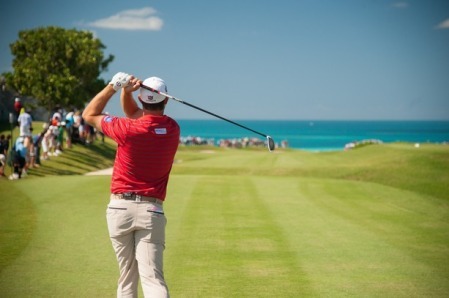 The Dubliner fired a four under 67 at Port Royal to finish a shot in front of US Open champion Webb Simpson on nine under par and become the first Irishman to lift the title and just the second European winner since Welshman Ian Woosnam in 1991. 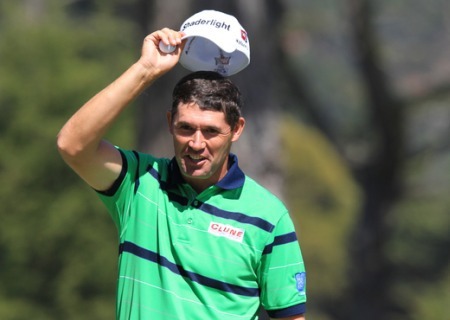 “It’s always nice to have three putts to win a tournament, and if you have three, take them,” said Harrington, who birdied the 11th, 12th and 13th to storm into a four shot lead and never looked back. 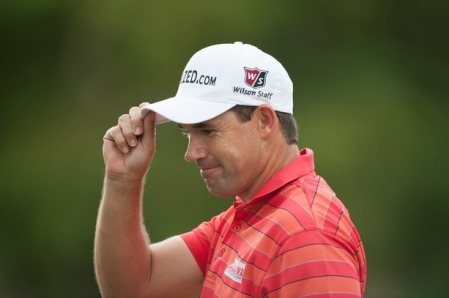 Winless in Europe or the US since he claimed his third major victory at the 2008 US PGA, it was Harrington’s first victory of any description for 738 days and his cheque for $600,000 was his biggest pay day since he finished joint second behind Tiger Woods in the 2009 WGC-Bridgestone Invitational at Firestone. The 41-year old was a late stand-in for injured Open champion Ernie Els this week. But having lost the Grand Slam title in play-offs at the Mid-Ocean Club in 2007 and 2008, he completed some “unfinished business” this time by notching his first success since he claimed the Asian Tour’s Iskandar Johor Open in Malaysia exactly two years and one week ago. “It was always the right decision no matter what,” Harrington said of his decision to pull out of this week’s $7m BMW Masters in Shanghai. “It is a bonus to come and win, no doubt about it. While he is missing out on the chance to return to the world’s Top 50 this week, the world No 57 believes the future is bright and that he can contend for majors and tournament wins before he retires. Asked if he could add to his haul of three majors, he said: “You don’t know what’s going to happen in terms of winning and winning majors. They are not that easy to come by. Leading by two from Bubba Watson overnight, Harrington drove the 380-yard fifth and two putted for birdie to remain two shots in front of the Masters champion and US Open winner Webb Simpson on six under. His lead was down to just one stroke through seven holes when Watson followed a bogey the fourth with birdies the fifth and seventh while Simpson also birdied par-five seventh. But while Simpson also birdied the 193-yard eighth to get to get to six under, Harrington holed a crucial 35 footer there to match him and remain a shot in front. Watson birdied the 10th to join Simpson, just a shot behind Harrington on six under par. But the left-hander dropped three shots coming home as he bogeyed the 15th and double bogeyed the par-three 16th for a 71 that left him tied for third with Keegan Bradley (67) on three under. Harrington grabbed the tournament by the scruff on the neck by hitting sensational approaches that led to a hat-trick of birdies at the 11th (four feet), 12th (four feet) and 13th (10 feet) and a four-shot cushion over Simpson with five holes to play. The American birdied the 14th, where Harrington got up and down for par, to reduce the gap to three. And when Harrington got up and down again for par at the terrifying, 235-yard cliffside 16th, holing a clutch putt from five feet to remain three ahead with two to play, he knew the title was his. “From there on, it was very much trying to batten down the hatches and get to the clubhouse,” Harrington said. “The 16th is a treacherous hole and it was a bonus to sit on a three‑shot lead going in there. A Simpson birdie at the 17th added to the drama but the American couldn’t chip in for birdie at the last and Harrington came up six feet short with a 45 footer, three-putting for his lone bogey of the day, a four under 67 and the narrowest of victories on nine under par.